No, we called a garbage truck. But you’ll have to do the job. 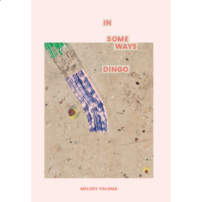 At the Melbourne launch of In Some Ways Dingo, fellow poet Sian Vate likened Melody Paloma’s debut collection to a road movie and on first reading I agree, a road movie where that endless horizon signifies loss or melancholy. And during the journey the poet acts as a bowerbird collecting urban myths, cult movies, and your pre-loved junk before arranging it all intricately onto the page, courting you to delve further. As a passenger in Melody Paloma’s taxi you travel through beaches, “through traffic lights in Brunswick” in Melbourne, into cinemas and front yards, observing and collecting, the cab isn’t big enough for you to contain your experiences, a larger receptacle, a garbage truck, is required. but as a memorial to memorial. As you are allured by the bowerbird’s intricate display and delve into the detritus, the collecting and recollection of memories you begin to see a deeper exploration and questioning of the Australian psyche. You travel through the ancient landscape of Australia, a place misshapen by colonial intervention. ghost gum across the face, until the Finke. Sparse and vast this collection of twenty-seven poems travels from the coastal, “AMAZING FACTS ABOUT WHALES!” reflecting on the “coast of Esperance”, to “camping in the centre”, “Wolf(e) Creek”, and taking in suburban, “climb up on the roof for a view/of the car park” in “Hyper-reactive”, a long and multi-faceted journey through the vast Australian landscape. You jump into Melody Paloma’s hire car, slide across the bitumen “until the vibrato of a cattle grid” which shakes you into recognising the deeper ecological and colonial messages at play here. Part of the poem “Special Values and Characteristics” being taken from the “Lake Gardiner National Park Management Plan. Adelaide: Department for Environment and Heritage. 2004” where “cultural values for Aboriginal people” can sit alongside “A geological resource that may have mining potential” and “A regional tourism resource”. A site where at 11am “the guy who runs things in his jocks/winnie blue and a JB”, a “scenic, aesthetic and wilderness” is also “a venue of international-standard for high-speed motor vehicle trials”, where “Special landscape appeal” sits alongside “’how fast can you go?’/record it in miles”. It is through this interrogation of “Australianess”, by writing about collecting paraphernalia, selfies, images of iconic places, merged with a soundtrack of Kylie, Nick Cave, Taylor Swift, that Melody Paloma creates a rigorous questioning of what it means to live in this country, as she explains; “I’m also interested in the pop culture references and artefacts that we attempt to assimilate and how this affects the ways we interpret and interact with our own history (often in a way that deals in erasure rather than truth-telling). I’m thinking about this also on a technological scale, specifically in terms of the medias we use to talk about and understand place. 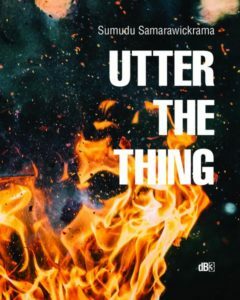 The ninth collection to appear as part of the Rabbit Poets Series, In Some Ways Dingo opens with the poem “Hyper-reactive” the recipient of the 2014 Overland Judith Wright Poetry Prize for New and Emerging poets. It is a thought-provoking collection where the “once found heinous” will “outlast memory” a reflection on what it is to be Australian. Take in the journey that is In Some Ways Dingo, collect the artefacts on offer, make sure you leave something behind for the travellers that come later, and as you are contemplating your new found treasures, log on to Stale Objects Press and observe where in the nation the bowerbird is currently collecting, there are plenty of riches on offer, you may even find a second hand telescope in a Woolworths carpark. Something you can use to explore beyond your current place. Maybe I should have likened In Some Ways Dingo to an American style road-movie, not a horizon of melancholy or loss but one where the horizon signifies hope. TM: Dingoes are not simply in the title of your book, they appear from time to time in your recent work too. What is the connection to the native dog? MP: I’m interested in the way settler Australians interpret and represent dingoes. To me, these representations seem to include a range of fixed ideas of dingo which mutate according to social determinants. Though different, each are equally colonising for the ways in which they control and distract. The images Australia uses to represent itself on a national and international scale, specifically those images that relate to landscape, flora and fauna, masquerade as soft and palatable but in reality, are actually incredibly violent when we start to dissect the reasons for their construction. Australia is kind of hell-bent on appearing as cute and loveable, a desire ultimately born out of its own white anxiety. Kitsch in relation to animalism is a direct example of this, I’m thinking specifically of the proliferation of big roadside ‘things’ (e.g. the big koala) as well as representations in children’s books (e.g. Snugglepot and Cuddlepie and Blinky Bill, on which Evelyn Araluen is writing an essay I am keenly awaiting). These examples of kitsch, among others, distract from any real conversation around Australia’s ongoing genocide, simultaneously, they are reductive and attempt to override Indigenous stories of and relationships to native flora and fauna. The thing about dingoes is that kitsch hasn’t really worked, there’s this real confusion for settlers about what a dingo actually is, the result of which is that we’ve had to keep recreating images of dingo that aren’t necessarily cute but still serve to control. There are three particularly ingrained representations of dingo that I’m interested in: the mythic graceful dingo (the dingo that is heard and not seen with which human encounters are brief and scarce), the dingo as murderous beast (fortified by the Lindy Chamberlain case), and the dingo as pest (enforced by the ultimate sign, The Dingo Fence). I think part of the reason why the Chamberlain case was maintained by such hype and continues to be so insidious is because it threw into question our idea of dingo, the colonial consciousness didn’t want to let go of the mythic graceful dingo that it had worked hard to establish, so the result was frenzy. However, rather than interrogate this, we created a new image – dingo as murderer, the dingo that should be eradicated. Of course, this also fits nicely with the other image of dingo as pest. None of these images of dingo actually touch on the reality of dingo. Settlers only ever access part of the thing. It’s not the actual dingo that is in some ways, but the images we use to represent it. TM: Memory, nostalgia, appears intermittently in your work (for example, “place a tick next to those that will / outlast memory” and “This brown, deeper than soil, / not a colour we remember”), this seems counterintuitive to a yearlong poetry practice that we can “witness being written”. Does reflection play an important role in your work? MP: I’m definitely interested in memory and nostalgia, as both problems and solutions. I think memory works in a lot of different directions so it makes sense for it to be appearing across my work in different forms; on the one hand we have memorialisation and nostalgia as a colonial problem, the way forgetting is intrinsic to memory, then there is the way Country remembers everything, something that is impossible to erase. There’s also personal memory and psychoanalytic interpretations of and interactions with the poem, specifically the way the poem has the capacity to hide or bury memories. The latter is something I am finding I’m engaging with in Some Days, rather than attempting to set it up as a work that is consciously diarising or confessing. TM: In Some Ways Dingo shifts between extremes, for example “We should help her” juxtaposed against “We should kill it”, are there any boundaries in your poetic practice? MP: I think extremities are probably important for me, part of my process involves making myself feel uncomfortable. Often poems enact or perform scenes that are problematic, specifically in regards to Australia, the colonial consciousness and whiteness. I want to interrogate how this manifests in a collective sense, historically/socially/politically/economically, but it also needs to be personal as I’m obviously not separate to these problems. I don’t exist outside of them, none of us do. I think in order to make a reader experience discomfort in a way that encourages interrogation you have to experience that first-hand through the practice of writing itself, otherwise it dissolves into virtue signalling. TM: As a frequent visitor to central Australia I was personally attached to several of your poems recalling that region. I get the feeling your work looks inwards for cultural references, rather than outwards from the shore. Is that a fair assessment? MP: That is a fair assessment, but I’m also very interested in the ways Australia enters an international conversation, specifically how it performs its Australian-ness. This relates specifically to some of what I was saying before about image production, but I’m also interested in the pop culture references and artefacts that we attempt to assimilate and how this affects the ways we interpret and interact with our own history (often in a way that deals in erasure rather than truth telling). I’m thinking about this also on a technological scale, specifically in terms of the media that we use to talk about and understand place. The ways in which settlers move through this country are too often done without care, sensitivity or willingness to interrogate that movement. Tourism feeds off this sort of problematic image-making I’ve touched on and refuses acknowledgement of any kind of ongoing genocide (to do so would be bad for the brand). TM: How are you finding the rigorous approach required for “Some Days”? Will you be spent once the project concludes? MP: To be honest I am really struggling with it at the moment, not so much having to add to it every day, but that it’s public. Part of the initial point of the work was that I did want to play with this idea of endurance, and tap into some things I was thinking through about ‘work’ more broadly. I also just wanted to see if I was capable of actually doing it. But now there’s this struggle that’s going on where it’s like, having to add to the work each day in a way that feels ‘complete’ is kind of feeding ideas of capitalism and ‘progress’ that I actually wanted to subvert. Where I was generally adding at least a line each day, and breaking the work up into months, I’ve started trying to free up the work a bit, it’s become more notational and scrappier, more process like I guess. But that’s also incredibly exposing, to allow people to see your work in that state of process. I’m trying to push against the capitalist impulse for progress, for ‘completeness’, I don’t want neoliberal ideals to infect the way I approach my own work. It’s sort of trying to use the tools of the state against them, in saying yes, I want rigour and I want work but I want it on my terms, through poetry, I want to ‘progress’, but my idea of ‘progress’ is not your idea of ‘progress.’ That’s not to say I don’t want the work to be finished and to be happy with what it is when it is ‘finished’, but it’s also my way of saying we are all always learning, always in a state of becoming, never finished. I like the ephemerality of the work, the idea that the whole work could change (or even be entirely erased) at a moment’s notice, that someone could engage with the work halfway through and view it as ‘complete’ even if it’s in a total state of disarray, that there’s a sort of battle for agency between reader and writer, or that one reader can have an entirely different experience with the poem than another reader, these are all attempts to engage in temporality that the technological structure of a Google doc allows for in a very specific and unique way. I’ve found it an interesting to engage with the way my own practice works. Poetry for me is really a place of working things through/out, I don’t think going into a poem with a fixed idea of what you want to say is necessarily always a good thing, sure you know that in part, in that you might have a set of ideas you want to explore, but to be able to let the poem take hold and let it go where it wants is one of the things I love about poetry. In part, it’s a bit of a homage to that. Sometimes poetry feels very visceral to me, by which I mean the poem speaks and your body just writes it and then you have to figure out what’s happened post-writing, like a way of engaging with your own subconscious. That’s a process that’s quite uncertain and unnerving at times, so to make that public, before I’ve even figured out what’s happening, is kind of fraught for me. That my relationship with the work is quite tender, and is always mutating, is quite fitting because on one level the work is also about friendship. The original idea for the work came out of wanting to respond to an artist friend, Sierra McManus, who did a drawing for me every day of 2017. To make something like a Google doc feel like an intimate space is something I’m also trying to tap into, that the digital is tender and produces affect, that devices produce feeling. There are often moments where I’ll go to add to the document and there are other users logged on, which on one level feels voyeuristic and violating, and on another provides comfort, these are paradoxes we’re brushing up against all the time in digital spaces. I’m sure I may have entirely different feelings and give a totally different explanation of the work once it’s done, which I guess is kind of exciting. TM: I ask all my interviewees this, it is helping to build a great reading list, what are you reading at the moment and why? MP: Alison Whittaker’s Blakwork, which I’ve been really looking forward to for a long time. I just finished Hunger by Knut Hamsun, published in 1890, set in Norway about an impoverished writer who essentially goes mad with hunger. I was depressed about being broke and trying to juggle work and writing and a friend leant it to me, in retrospect maybe a cruel joke. I’ve read some great Tony Birch essays lately about ghost towns, he’s talking about the ways in which we historicise pioneer towns, and memorialise landscape to exclude Indigenous histories, particularly in Western Victoria, one called ‘Death is Forgotten in Victory: Landscapes and Narrative Emptiness’, and another in an old issue of Meanjin called ‘Come See The Giant Koala’, both of which I loved. Poets on my bedside table at the moment are Kate Lilley, Michael Farrell, Pam Brown and Lionel Fogarty. I’m a very unfocused reader, and writer actually, especially when it comes to poetry. I can’t really read or write one thing at a time, from start to finish. It’s too much. Poetry is too intense for that and my brain is too messy. There’s an interview with Melinda Bufton on Poetry Says in which she talks about her poetry reading style as creating mix tapes, reading a few poetry titles at once and not reading linearly, which is something I also do and find to be quite a joyful reading practice for the strange connections you often find. TM: Finally, another question I ask all interviewees, what’s next? Are you working on anything, outside of “Some Days”, that you can tell us about? MP: I’m writing an essay at the moment about dingoes and more broadly image-making and kitsch in Australia, which I’ve touched on a bit in this interview. It’s something I’ve been thinking about and talking about writing since writing In Some Ways Dingo. One reason I’m looking forward to the end of Some Days is so that I can direct poetic attention elsewhere, as I’ve found it hard to write other poems at the same time. I want to write a collection about water that I have a few poems for but am very much still figuring out. I want to set part of it in a fictionalised hybrid of Old Jindabyne and Old Adaminaby, two towns that were drowned in the construction of the Snowy Hyrdo Electric Scheme. In my head right now it appears as a sort of feminist utopia (though utopia isn’t quite right) that I want to use to interrogate the mythmaking that occurs in memorialising Australian townships, as well as the way colonisation and genocide extend into futurism and utopia-building (see ‘Coded Devices’ by Maddee Clark). TONY MESSENGER is an Australian writer, critic and interviewer who has had works published in Overland Literary Journal, Southerly Journal and Burning House Press. He blogs about translated fiction and interviews Australian poets at Messenger’s Booker. He is on Twitter @messy_tony.